Built from wood and copper, this little bot's prime directive is to make you smile. It wants to make you smile. It will make you smile. Dig it. Your robot will inspire your home. Your robot will complete that nagging emptiness on your desk. It will hold your spare batteries, pencils, business card, and your heart. This robot can't be beat. This bot is made walnut finished with linseed oil. Every bot is unique so yours will look slightly different. Some pictures show how this bot interacts with others and how wood grain and pattern may vary. Your little bot stands about 5 inches tall. The copper wire is friction fit so you can bend arms, legs, and necks to pose your robot. This bot can be played with by older children, but is not intended as a child's toy. Rough play can abuse and break the robot. Small parts are certainly a choking hazard. Included is a use and care guide, and 10 year warranty. Interested in purchasing more than we have listed? No problem. We can make as many as you need (typically with quick turn around times). Just send an email to don@happybungalow.com or contact us via our website. Robot Dog made from Hickory, steel, and magnets. Wood Robot Toy Made With Young Children In Mind. 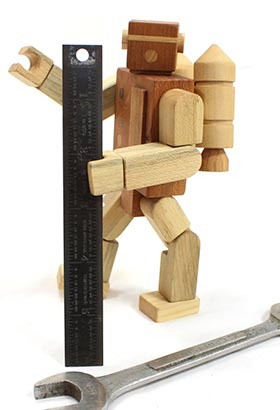 Wood Robot Toy. Finished with Beeswax, arms and head spins.